Prime Minister Hun Sen yesterday called on local authorities to ensure public safety and security during Khmer New Year, which runs from Sunday until Tuesday. Mr Hun Sen said on Facebook that he hopes Cambodians will decorate homes, resorts and pagodas to welcome the new year. He noted that many people from cities across the Kingdom will travel to their hometowns to be with family. Mr Hun Sen said authorities should pay attention to road safety and ensure that locals and international tourists enjoy their time without concern. “I urge all authorities to be attentive to road safety in order to make sure that travellers and foreign tourists find it convenient to pass through border checkpoints and airports,” Mr Hun Sen said. National Police chief General Neth Savoeun yesterday said a directive was issued last month instructing national and provincial police officers to draft an action plan for Khmer New Year. He added that police officers should safeguard places of gathering such as temples and resorts. Major General Chuon Narin, chief of Preah Sihanouk provincial police, said a plan has already been submitted, as per Mr Hun Sen’s request. Maj Gen Narin said the province is ready to host the Sankranta Sea Festival. 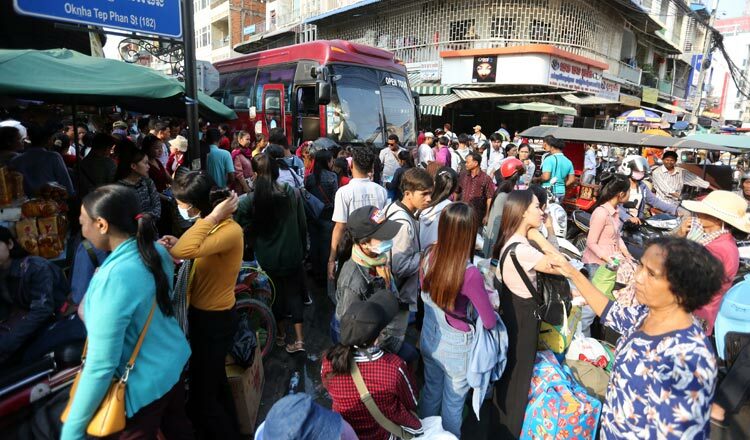 Mao Phirun, Kandal provincial Governor, yesterday said traffic police have been assigned schedules. Mr Phirun said they are ready to help ease traffic congestion on major roads connecting Phnom Penh with other provinces and to prevent traffic accidents. According to a report by the National Police’s traffic and public order department, 47 people died and 143 others were injured in 91 traffic accidents during Khmer New Year last year.